Are you coming to Cannes for your holidays or for one of the major international conventions? Certification guarantees the reliability of affiliated property professionals in the city who specialize in the seasonal rental of furnished accommodation. The label brings you the security and assurance of finding motivated professionals committed to the maintenance of value for money in the rental sector of destination Cannes. By dealing with a certified agency you can be sure that you are not doing business with an illegal intermediary. Professionals holding the label of Certification have undergone, and continue to undergo, probing controls. They undertake to respect a demanding professional charter which guarantees a serious business attitude, a high level of quality and effective monitoring of performance. Certification offers the organizers of major events in Cannes peace of mind in respect of the reliability of services provided for their participants. 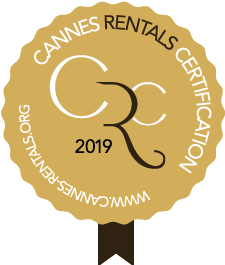 Agencies qualifying for the Cannes-Rental-Certification label participate actively, in close concert with other actors in the tourism sector, including local authorities, to improve all aspects of the welcome our visitors receive. The certified agencies meet the precise criteria imposed at the time of entering the scheme and confirmed during subsequent annual inspections. Full and complete verifications are carried out in order to confirm the solidity and stability of members of the scheme, their sound management methods, their experience in the rental sector, the transparency of their operations, their commitment to their clientèle and their ethical code of practice. They sign a demanding charter of commitment as professionals guaranteeing to their clients a serious business attitude, a high level of quality and effective monitoring of performance. As well as accepting regular controls, their directors & managers personally devote time throughout the year to actions undertaken with a view to continually improving client relations. Thus, certification creates the right conditions for the organization of a profession resolutely oriented towards the long-term satisfaction of visitors to our beautiful city of Cannes!